Testing a new product is one thing. Seeing it in action out in the real world is something else, a fact I was reminded of yesterday in the Time Warner Center perched on the corner of Central Park. Between meetings I happened into one of New York City's rarest of commodities, a public bathroom (and you thought I was going to say "courtesy" or "good manners" or "proper grammar"). I wasn't loitering in the men's room, unlike some politicians we know, honest. Nature called, so I followed a long line of tourists into the facilities. The first thing I noticed in the room was a pair of Dyson Airblades stuck to the wall. 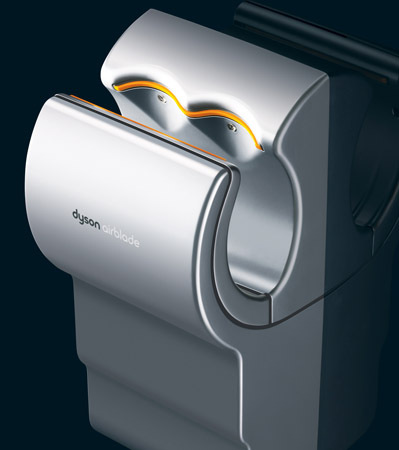 For those unfamiliar with the Airblade, it's a rapid hand drying machine made by the snooty Dyson vacuum cleaner company (for a complete description see, "Blow It Off"). It's not unlike the machines in public restrooms in Japan and elsewhere (not that I'm on a world tour of men's rooms or anything). It's better than the hot air blowers because it doesn't make your hands chapped and it's faster. It also saves trees because it obviates the need for paper towels–although if you wash your face…you have to go back to paper towels. But I digress. Seeing the Airblade for the first time in a public space I was intrigued to notice a few things. First, no one else in the men's room even noticed the devices; they clearly didn't know what they were. Second, I was the only person to use them in the crowded facility. (This is not intended as some crack about how people don't wash their hands after using the bathroom. People did wash their hands while I was there–especially the tourists–but they used the paper towels provided.) Third, the Airblade worked, but it took two passes of my hands through the machine to get them really dry. So clearly Dyson has to spend some marketing money if the Airblade is going to really going to take off (you didn't really think I was going to pass up on that obvious pun, did you?). And my experience proves once again that the greatest technology in the world won't make a wit of a difference if no one knows what it is or what it does. This entry was posted in Uncategorized and tagged airblade, green, quain, technology. Bookmark the permalink.